Is it too late to be sharing Christmas present sewing still? This post is also kind of cheating since I actually barely did any sewing on these. My sister has a lot of friends with babies and thought it would be fun to sew them some Christmas presents, so I agreed to give her some guidance while she made them. 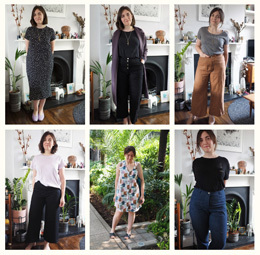 For an absolute non-sewing beginner I’m amazed at how well she did: we jumped right in at the deep end with stretch fabrics, overlocking, fitting jersey bias bindings on a curve and elastic waistbands, and she handled it all fantastically – much better than my early garments. We barely had to unpick anything and swearing was minimal. I guess I’m just an awesome teacher, eh?! We made three sets of baby PJs from the same pattern, all from Brindille & Twig on Etsy. These are nice basic patterns in a handy range of sizes from newborn to 3 years, so we were able to re-use them for each baby at a different age. You could easily make them into a ‘day’ outfit with different fabric choices too, so I’ll be keeping them on hand for more potential baby gift makes in the future. For two little boys, Freddy and Arthur, we used this adorable rocket print jersey, snapped up from KitschyCoo in her Black Friday sale. 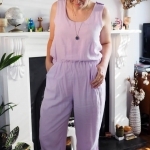 It’s pricey stuff so I only bought a yard, which with some thrifty cutting we nearly got two full sets out of – just the sleeves of one top needed to be cut in a different fabric, some grey marl jersey from my stash which we also used for the neckline trim. The waist is encased with wide elastic and all hems are zigzagged. We made a third, larger, set for two-year-old Erin, from some equally cute safari animals jersey from Boqinana on Etsy who stocks all manner of adorable jersey prints (omg tiny kittens and puppies, squeee). For this set we used stretch bias binding on the neckline and did a ribbing waistband instead of the encased elastic. 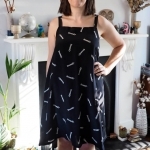 This was the first one we made and you can see the neckline turned out a bit loose: I don’t know if this was a pattern or sewing fault, but the pattern pieces do look considerably different to the final garment around the neckline – much ‘scoopier’ with less of the shoulder seam crossover. For the boys’ ones we corrected it by pulling the neckline tighter and shaving off the excess, which did the trick. It was fun teaching Natty to sew, and I think she’s getting the bug since we’re also making her a dress and some lounge pants next. I’m all for spreading the sewing love. Wow your sister did a great job. You must be a natural teacher. What?? I still can’t sew knits as well as your sister! Beautifully done, you two! Beautiful! Also, I’ve been struggling to find nice baby patterns for boys so, thank you!! These look amazing! I’ve been looking for a top pattern just like that so thank you for the link! I Love those fabrics you’ve used too!